Automotive Services by Kincheloe Motors of Parkersburg, WV, providing clean and reliable used cars trucks, and SUVs for every budget. Kincheloe Motors is your one stop shop. We welcome the opportunity to service all of your transportation needs. Why are we different from the rest? WE FIX CARS. It's that simple. We are the experts in Sales, Service, Parts and Collision Repair since 1948. With decades of experience in a competitive market, Kincheloe Motors has remained a strong force because we meet and exceed our customers' expectations. We have some of the best technicians in the area. Our expertise paired with our low labor rate make us the best value and bang for your buck in the area. We are a former Five Star Chrysler dealer and now operate as an independent dealership, specializing in quality pre-owned vehicle sales, service, detailing, parts, collision repair and vehicle financing. PROFESSIONAL VEHICLE DETAILING AND DEODORIZING PACKAGES AVAILABLE. Call ahead to reserve a spot at 304-485-7576, availability fills up quickly. We are the Experts in Service, Collision Repair and Parts......since 1948. There isn't a more qualified group of technicians in the area to care for your vehicle. Our technicians are experts. 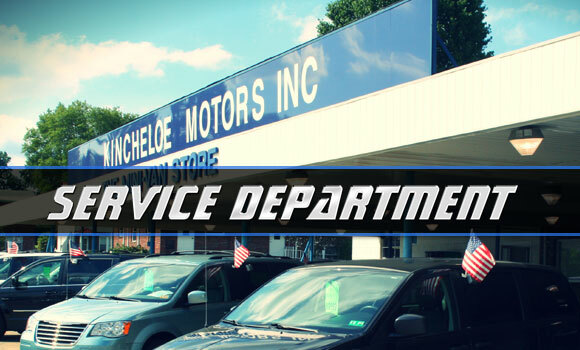 Their years of expertise is unmatched and in combination with our low labor rates, Kincheloe Motors offers you the most bang for your buck. We help you make decisions that will ensure the long life of your vehicle while keeping your maintenance expense to a minimum. We've been told one of our best traits is that we know you and your vehicle. We can tell you and show you what we see on your vehicle in a WAY THAT YOU COMPLETELY UNDERSTAND. We show you, educate you and give you the information you need to make the best decision for your vehicle. Our Collision Repair Center has received numerous awards and is known in the area and among insurance companies as a shop that turns out some of the best quality work in the area. Inform your insurance company that you plan to have your vehicle repaired at Kincheloe's. QUALITY WORK THAT IS GUARANTEED. Vehicles are one of the most expensive investments you will make. Maintaining your vehicle is our expertise. Regular maintenance at Kincheloe Motors will ensure your vehicle will be with you for a long time----and in excellent condition. Our Parts countermen have vast experience as technicians. What does that mean to you? We order it correctly the FIRST time saving you time and keeping you on the road. Allow our experts to give you all your options when it comes to your parts needs. You will be suprised at the quality, longevity and peace of mind our parts can offer you.